Asthma: Could Your Childhood Asthma Recur? ​As adults never outgrow childhood asthma, they need to be vigilant to prevent attacks, says Dr Tan Ngiap Chuan, Senior Consultant and Director of Research, SingHealth Polyclinics. Although Mdm Zarinah* had asthma as a child, she did not suffer from it throughout most of her adult years. But that changed in 1992, after she underwent radiotherapy for breast cancer at age 40. “My lungs were affected because I had radiotherapy on my chest area. Before that, I hadn’t had an asthma attack for almost 20 years,” said the 60-year-old. Now, if the environment changes, she could get an attack. While on a recent visit to the Middle East, a sudden sandstorm caused her asthma to flare up. “It started as a cough with a bit of a sore throat and dryness. Then, I began wheezing,” said the retired translator. Mdm Zarinah’s experience highlights a little-known fact: People with asthma may appear to have outgrown it in adulthood, but must always be vigilant. “Once you have asthma, you tend to have it for life,” said Dr Tan Ngiap Chuan, Senior Consultant and Director of Research, SingHealth Polyclinics, a member of the SingHealth group. Asthma is a disease of the lungs that affects the airways which deliver oxygen to the body. Inflammation causes these airways in the lungs to narrow and produce phlegm, leading to further blockage. The patient will suffer from breathlessness as a result. Breathing through the narrowed airways causes wheezing – a characteristic of asthma. Because of their smaller airways, children are more susceptible to the disease. Only a little narrowing of a child’s airways will cause him discomfort, while adults must suffer significant narrowing before they experience severe symptoms. Children with asthma must be reviewed by a doctor periodically, every three to six months, even if they are not on any regular treatment. One way of diagnosing asthma is through a lung-function test, in which the patient blows into a device called a spirometer, which allows medical staff to measure the flow of air from his lungs. Other symptoms of asthma include a sensitive nose or eczema, a skin condition. Studies show that a high proportion of children with severe eczema also have asthma. Some patients also have sensitive eyes which can get very itchy and teary. The illness may be hereditary. Mdm Zarinah’s mother, for example, had asthma. There are two main types of stroke. The more common, called ischaemic stroke, is caused by the blockage of a blood vessel supplying the brain. Less common is the haemorrhagic stroke, which is usually due to the bursting of a blood vessel in the brain.For asthmatic patients managed at SingHealth Polyclinics, including the Pasir Ris branch where Dr Tan practises, nurses stationed at the entrance will look out for patients who show signs of breathlessness. The nurses will then check patients’ medical histories to see if they are suffering from asthma. Patients who are experiencing breathlessness, and are known to have a background of asthma, will be taken immediately to the polyclinic’s treatment room, where specially trained nurses will start rescue treatment. This is the result of a new programme where nurses are trained to examine patients’ chests and proceed with acute treatment of an asthma attack once it is detected clinically. This allows those with acute asthma to be managed rapidly, as the disease is potentially life-threatening. Once the immediate symptoms have subsided, doctors will review the patient’s asthma status and educate them on selfcare measures. 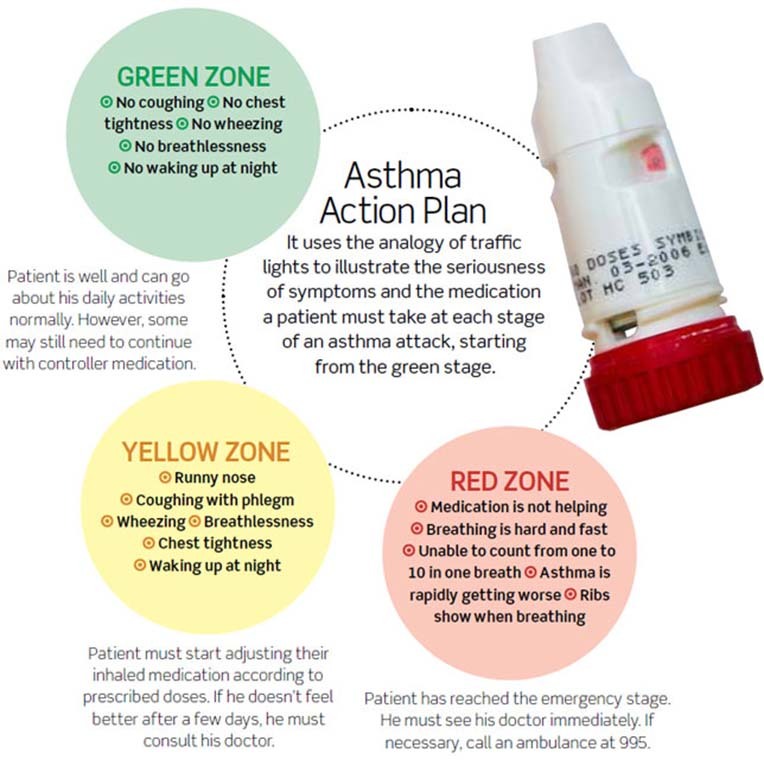 This includes providing them with a written Asthma Action Plan (see above). Mdm Zarinah’s doctor customised such a plan for her. Under the plan, she needs to adjust her dosage of medication for a short period of time to prevent attacks. She also carries quick-relief medication that she can use to open up her airways and increase airflow to her lungs. On days when she is well, she takes only her controller medication every day. When she is not feeling well, she knows how to increase her dosage or take oral steroids based on the plan. If her symptoms do not subside after several days, she is instructed to see her doctor immediately. “The action plan empowers me to take better care of myself,” said Mdm Zarinah. The SingHealth Group’s nine polyclinics see 2,300 to 2,500 asthma patients each month and compiles asthma data monthly. In September 2012, asthma patients numbered 2,430, of which 56 per cent were women. There has been a rising trend of asthma in Singapore over the past few years, but “we are still trying to understand why this is happening”, said Dr Tan. Fortunately, only 9.3 per cent of asthma patients who visited the polyclinics needed rescue therapy, where patients are given medication through a device called a spacer, which helps a patient inhale the medication that goes directly into his lungs. The Singapore National Asthma Programme was launched in 2001 by the Ministry of Health to address the high prevalence of asthma in Singapore. It aims to teach patients ways to take better care of their condition on their own, and improve asthma control in the community by promoting preventive treatment.